Excellent managerial skills, efficient commitment and novel thinking. 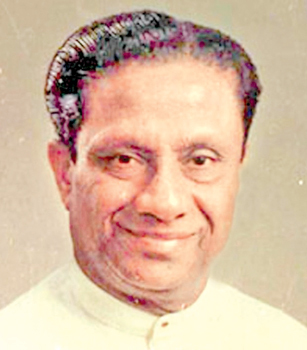 President Premadasa foresaw a multifaceted, selfless career. Noble qualities, political stardom acquired by degrees in glory. Architects floodlit the Premadasa International Cricket Stadium at Kettarama. Action-oriented leader, simple ways sans glamour. Highly patriotic fashion of his own, worthy of emulation. Massive crusades, mammoth feats none can deface. Desigar Ramanujam was born in Ramanathapuram, South India, on July 17, 1907. Upon completing his higher studies, Ramanujam commenced a career in journalism and by the late 1920s, was an accomplished. It was during that time that he joined the editorial staff of the local Tamil Newspaper Desa Bakthan. In 1943, he became a teacher at Dharmaraja Collage, Kandy. Due to his fluency in English and Tamil, he was summoned by the Kandy courts to translate evidence from Tamil to English. Witnessing the hardships faced by low-income Tamil workers, particularly those working at the Kandy Municipal Council, Ramanujam went on to form an association called the Bose Sangam, in order to safeguard the rights of Indian workers who lived in the Mahiyawa and Asgiriya areas. During this period, several such trade unions were formed in different parts of the upcountry, to represent Indian workers brought to Sri Lanka by British Plantation Companies to work in estates. In 1937, Jawaharlal Nehru was sent to Sri Lanka by Mahatma Gandhi, to look into the problems of Indian workers. Leaders such as Rajalingam from Nawalapitiya, Suppiah from Badulla and a few others who were leading their own trade unions, met with Nehru at the time. It was with Nehru’s advice that those leaders decided to dissolve their individual trade unions and form one national trade union to represent Indian workers. Thus, the Ceylon Indian Congress (CIC) was born, which later came to be known as the Ceylon Workers' Congress (CWC). Ramanujam, Rajalingam, Suppiah and few others were the founding member of the CIC. Ramanujam was elected to the Kandy Municipal Council in 1943, while representing the Asgiriya ward and in 1946, he became the first person of Indian Origin to be elected the Kandy Deputy Mayor. During this period, he was responsible for providing pipe-borne water to the Asgiriya Maha Viharaya. Ramanujam received the blessings of the then Asgiriya Chapter Mahanayaka Thera, who urged residents of the area to support him. Ramanujam served the ward for 13 consecutive years. He was elected at the first parliamentary election held between August and September, 1947, contesting as an independent candidate to the Aluthnuwara electorate (presently Mahiyangana) and securing 46.6 percent of the total votes; 1,437 votes ahead of his primary rival, while defeating three other candidates as well. He thus became one of the seven CIC members elected to parliament in 1947. Ramanujam worked tirelessly for the rights of plantation workers as the CWC Joint Secretary. 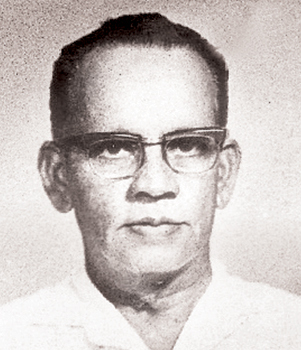 He represented Sri Lanka as the workers' delegate at several annual meetings of the International Labour Organisation (ILO) and his contributions to these sessions were always respected as well as appreciated.In 1961, former Prime Minister late Sirimavo Bandaranaike offered Ramanujam a seat in Parliament as he was a friend of late S. W. R. D. Bandaranayake, but he had declined the offer. In 1962, the International Confederation of Free Trade Unions (ICFTU), recognising his contributions to the trade union movement as well as his achievements at ILO meetings, invited him to join their organisation, where he was given the task of supervising sugar plantations in Mauritius. He was subsequently transferred to Ethiopia, in order to establish trade unions during the regime of Haile Selassie. In 1965, the ICFTU appointed Ramanujam as their special representative in Singapore. His task was to persuade the National Trade Union Congress of Singapore to amend its constitution, to become an internationally-accepted trade union. He was then appointed ICFTU South East Asia Regional Director. In 1968, the ICFTU appointed Ramanujam as the Asian Regional Director, based in India; however, he suddenly passed away on June 4, 1968, before he could commence work. The international trade union movement lost an honest human being who served workers both local and international. Ibrahim, you returned to the permanent abode of Jannathul Firdouse during the Holy month of Rajab, on April 16, this year. What more could one pray for other than to answer the call of their creator? Your peaceful end proved your unshakable faith in Allah. The end justifies the means could not have found a more worthwhile example. You never failed to recite daily prayers and never let inclement weather conditions or health complications impede any of your plans. When you were warded at a state hospital, you managed to find a convenient place between the bed and the locker to offer your prayers. I was lost for words when I saw you prostrating in that cramped place. Ibrahim, do we need a better situation to support our opinion on the strength of your emaan? Your life was based on the intrinsic value: I am what I am. I am not what I am not. This principle guided you right throughout your journey in this uncertain world. Publicity and pomposity are two things that did not corrupt you during your life. You did not struggle or strive to outdo or outsmart anyone in any given situation. You found little or no time for arrogance and had a strong sense of family. We both shared the same political ideology. I invariably depended on you for verification and clarification on matters of politics both local and international, aside from religion. I knew for certain that your intellectual experience simply could not be doubted or ignored, as it was based on authenticity. In this day and age, where pseudo-piety is fast-gaining ground, faithfuls of your ilk is a rarity. The Janaza prayers organised by Representative of Sri Lanka to Palestine Fawzan Anver, which were conducted at the Al-Aqsa Mosque in Jerusalem, was in the Almighty Allah’s last will that was bequeathed to you unreservedly. May Allah grant you Eternal Bliss hereafter. It has been almost a year since we learnt that our close friend Chanaka was ill. As the months rolled by, the mantle of darkness descended swiftly. We witnessed him wither away and become a shadow of his former self, while we stood by his side, powerless. I for one, could not bear to see him in that state, but my friends bravely stood by him, holding his hand, even though most often, he rejected their support. This was the nature of the man; he could not handle the attention he received to the very end. The suffering he had to endure was finally gone, but for us, we lost our sheepdog; our guide and helper is forever gone. When I say us, I speak for all our friends. All of us depended on this bloke to protect and guide us during our wild escapades. We knew each other from school (St. Peter's College, Colombo) and for most of us, that was counting over 50 years. As for our core group, which comprised of 15 members, most of us lived within walking distance to our school. Chanaka was exceptional, as were his father and mother, who provided us with much love from our childhood well into our adult years. Those were the days of simple pleasures; the Sunday swims at Kinross, Saturday evening choir practices and after-school movies (9.30 pm) and kottu dinners. Chanaka possessed the true spirit of a Peterite. He was solid as a rock and was the cornerstone and foundation of the love and friendship that bonded our group into a brotherhood. However, he is gone now, too soon and in the saddest of ways; it is in all sincerity I say, that the love he gave us, may in the end, have been his undoing. His time was not only his, but ours as well; he gave us love, understanding, attention to each of our families, extending to our parents, siblings and even our children. I know for certain that he did the the same for a wider circle; from his colleagues to many he met during his life! I remember Chanaka had more time for my mother than I ever did, giving her advise on her little investments; in fact, it was a standard joke amongst us that he knew more about what she was worth than I ever did. She loved him as her own and this would be the only time I could ever say that I was glad she was not with us anymore; not to to witness his fate. It was not just my mother; he was the same with all our parents. Our hearts ache for his mother who had to bury her son. She was not alone as there were many other parents who would have felt as they were doing the same. How did he give so much of himself? Perhaps it was partly because he was single and as much as we urged him to find a partner, for whatever reason, it never happened. He would have made a wonderful husband and father. He was like Santa Claus to all our children when they were growing up. He loved everyone unconditionally, but in the end, he did not find a way to look after himself. We could all sit down and ponder on what he could have done differently, but then again, we know there was no way he would have done anything differently. We could all be sheep, because he was there for our needs and emergencies. That being said, there was one thing he did not understand and that was how to accept our love and care during his time of need. Chanaka has left us and we believe he has gone to a better place. As one of our friends said, “We would all be joining him someday.” Yes, who better than Chanaka to be the vanguard, to prepare a place for us, just like he always did. If Chanaka was our sheepdog, most of us also had a shepherd and that was none other than our dear friend and mentor Rev. Fr. Claver Perera, also dearly departed. Goodbye, my friend; until we meet again. Dharmawansa Dias Ranasinghe, a Deputy Labour Commissioner, passed away in October, 2017, at the age of 96 years. He was a senior labour officer at Avissawella during the 1950's. His native town was Mudungoda in the Gampaha district. One of my uncles worked with him at the Avissawella labour office who introduced and proposed this genuine and dignified gentleman to my elder sister. I think one of his contemporaries was Arthur De Silva, who also worked with him at the same office. He too, rose to be an Assistant Labour Commissioner. My mom became a widow when she was nearly 34 years of age when my father passed away suddenly, leaving her with four young girls. There was no financial burden, however, as my father was a wealthy businessman during that era. All four of us received a sound education at Ferguson High School, which was an English Baptist Missionary school. When my elder sister turned 18 years old, my mom wanted to give her in marriage as early as possible, as she wanted to look for a good son-in-law to strengthen the family as my father was the only child of his family, whereas my mom had only a sister in hers. 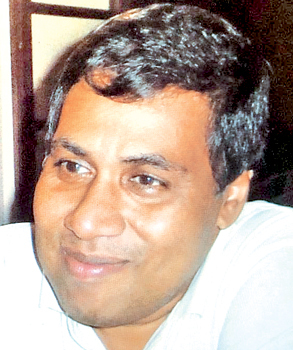 As I recall, Chandra Weththasinghe, then the Chief Clerk at the same office in Avissawella believed that D.D. Ranasinghe was the ideal person to marry my sisiter. Then my mom consulted another uncle who lived in Gampaha; a former Drill Inspector, Lionel Wijesundara. His advice to my mom was "If you honour a wealth that will never perish, D.D. Ranasinghe is the best person to give your daughter in marriage to." The wedding was held in 1957 and he was a pillar of strength to our family. 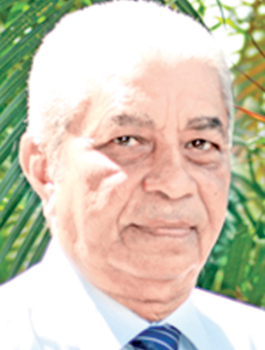 Later, he shifted to Havlock Town to educate his children, where he started working in Narahenpita and later, was awarded a scholarship to Britain. He was a Justice of Peace, Samatha Mandalaya President and a Nawala YMBA member. When dealing with Labour laws, he was always impartial. He was successful due to his humane principles. He leaves behind five sons, a daughter, six grandchildren and his wife, Somalatha Welikanne. My sister was lucky to be married to Rane aiya. May he attain the Supreme Bliss of Nibbana.